Your thoughts and beliefs create your reality, and what you see in your physical environment confirms your beliefs. Do you understand this? 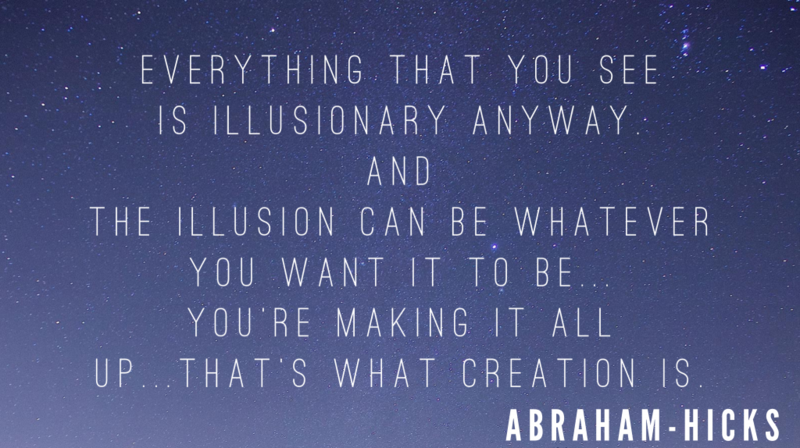 YOU create what’s REAL, and then you think your beliefs are accurate because you SEE what you BELIEVE in front of you! If you don’t like what you see or what you experience in your daily life, it’s not others who need to change – it’s YOU. The reality someone swears up and down is real is real – to them. 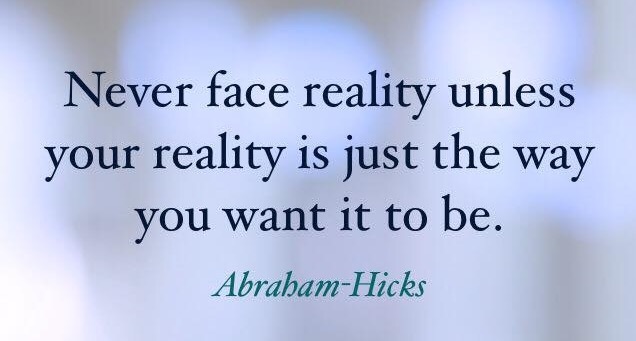 Another’s so-called reality has nothing to do with your own. Similarities depend on shared beliefs, but your overall experience of reality is yours alone. Every thought and every belief, whether you agree or not, is a choice. While our parents and elders gave us the building blocks of our beliefs, as you get older you tend to realize that you are free to choose what to believe. When you know this, you are free. If you believe people are unkind, you will experience it daily. If you believe people are bad drivers, this will be your experience every time you get in your car. If you believe people are kind, strangers will undoubtedly go out of their way to help you. 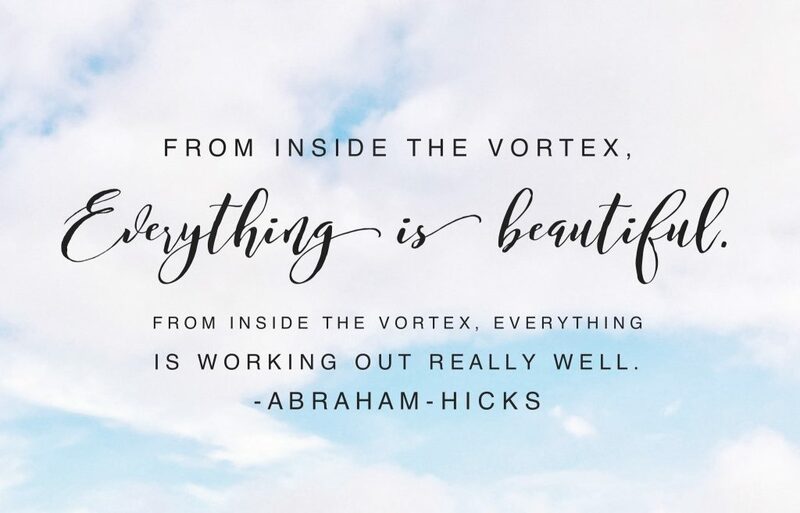 If you believe everything is always working out for you, you won’t be phased by any perceived setbacks because eyes will be focused on the silver lining. So the saying that goes “I’ll believe it when I see it” is actually “I see it because I believe it”. You can believe that the devil is real, or that a modern age demon Jesus is running rampant in society, while others who don’t hold these beliefs will remain untouched by these low vibrational worries. Sure, the devil exists, but only in the realities of those who believe he does. Do you think you have proof that the Devil is real? You might, but you made that up too. This is why you can argue both sides of a belief. If you focus on anything, you’ll find it. This is why denial is so powerful. Our beliefs can keep us in denial over something that may be completely obvious to an outsider. It’s so easy to see other people’s hang ups because you don’t have their unique belief system or the investment in their story. Perception is such a fun topic. The same event can happen to multiple people and their reactions will be completely different. One person can internalize an event and believe they are a bad person because something happened to them. Another knows that everything is always working out for them even in the midst of chaos. This person knows that something better is coming about. Yet another can take the event personally and believe whatever occurred was done to deliberately harm them. One person can lose their cool in a crisis and freeze. Another loses their cool in a bout of angry outrage, and yet another calmly takes control! What causes the different reactions? Differing realities based on different beliefs, different thought processes, and different life experiences. Every action and reaction are split second choices made based on your beliefs, habits, and experiences. Does a “common reality” actually exist? I believe that it does, but that most humans can’t see it. Most humans see a reality completely clouded by their beliefs. Those who have begun to raise their vibration may more easily see how different beliefs lead to different reactions. The more in tune with spirit you are; the more in tune with your higher self you are, the more you know that reality is subjective and entirely based on the mindset of the perceiver. Once you understand that everyone is creating their own version of reality, the easier it is to co-exist with them! This has a much deeper meaning than you may realize. 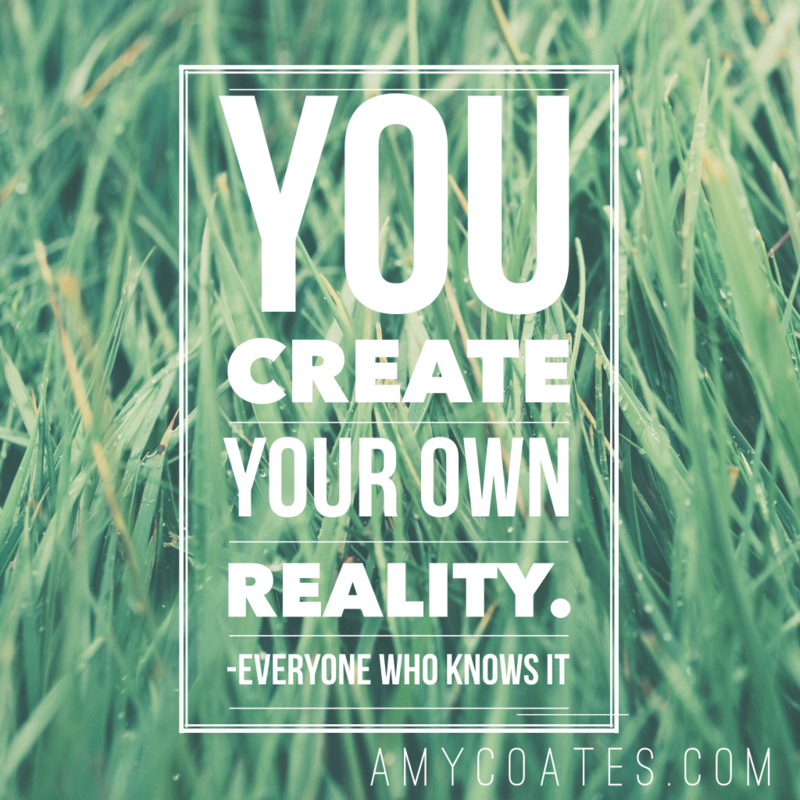 You create your own reality – Every aspect of it. This means that you create your own versions of other people as well. The spouse that you think you know so well doesn’t really exist in the way you think he/she does. We are all learning and expanding consciously in every moment of every day. The only constant is change. If you think you know anyone, you don’t. What you do know is the version of them that exists in your mind. And their behaviour can change as easily as your thoughts do about them. This is why it is so important to think kindly of others. Even the seemingly most ruthless of humans is an extension of Source. If you think anyone is apart from Source, you are holding them outside of the light and that can never be so. Action Steps: Choose someone that you don’t like; someone that pushes your buttons whenever you think of them, and move them into the light in your mind. Give them the benefit of the doubt. Focus on what you like about them. Forgive them for whatever transpired and let whatever happened in the past not move a moment further into the present moment. There is no sense bringing the past into the future. Decisions were made at the level of consciousness that was attained at that point in your perspective journeys, and none of that matters now. What matters now is letting go and moving on, and seeing the aspect of the Divine that is within them. You don’t need to become friends with this person. There is no need to contact them, or to be in their presence. All you are doing in this exercise is seeing them as Source sees them: with love. See them with love, take a few deep breaths, and see anything that is not loving leave your mind and your body. Take as many breaths as it takes to feel the release and to know that all are worthy of love. And now the fun really begins. When any unloving thoughts arise, remind yourself that everyone is an extension of Source energy and that you will see them with the eyes of Source: with love. Pay attention to your thoughts about this person but don’t be invested in the outcome. Choose better thoughts and let go. Then if you happen to see this person in the future, take note of how the interaction goes! If you are doing the work, your experience will change for the better. It is law! Alignment is everything. It’s knowing when someone needs a hug and it’s knowing exactly what to say, even in the toughest of human moments. It’s having the best timing and the sly punch line. It’s pure heart wide-open perfection. It’s unconditional love and everlasting joy; pure magic in every waking moment. How do you get there? One day, one moment, one thought, one nap, one meditation, one desire, one mistake, one laugh, one puppy; one step at a time. How do I know when I’m there? You’ll be happy. 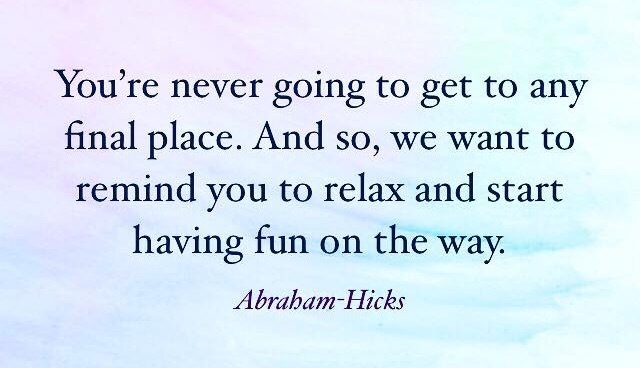 You won’t take yourself too seriously. You won’t sweat the small stuff. You’ll laugh out loud at the funny voice in your head. You’ll ask a question and receive the answer straight away. You’ll know things without explanation. You’ll understand without having to bring someone over to your perspective. You’ll love and appreciate with reckless abandon and you won’t notice anything other than the beauty inherent in all things. You’ll attend the buffet of life, take only what you desire and ignore the rest. You’ll live in the now. You’ll be the light in the room. One day last week I woke up from sleep with the knowing to cancel my plans for the day/night. I decided then and there that I was going to surrender to this thought; to surrender to my inner being forevermore. The time had come to listen to that little voice in my head. That voice has always been there, but I’ve often ignored it, countering its optimism with belittling thoughts. I don’t know why I didn’t think I was good enough to follow through with all of the wonderful ideas that flowed through me, but in that moment I knew I had to be free. I couldn’t deny it any more. Each morning when I wake up, I reaffirm the desire to give up any resistance to my inner being’s calls. I affirm to do my best to listen and follow through with this incredible gift of guidance. I will lay in bed and meditate until I feel the solid connection between the physical me and the non-physical me. Essentially, I feel for the love that I know is shining down on me. My heart chakra glows outward to the point of pure ecstatic bliss. I can feel my root chakra, sacral, and solar plexus chakras activated and burning bright as well. My throat, third eye, and crown are clear. 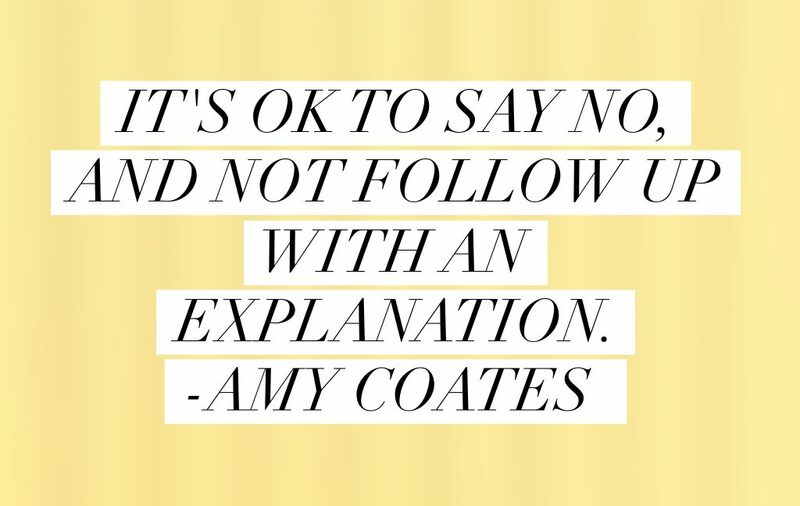 And then I go through my day as “Source as Amy,” talking to that little voice in my head throughout the day that is so excited to play with me. There is nothing quite like living your life while fully allowing Source energy to pour through you. I have the best moments ever. Each moment is new and exciting. Each moment is my favourite. Because, even though so many moments are precious and exciting, even looking back to enjoy their deliciousness isn’t as good as feeling fully alive in the present moment. For the past 2 weeks I have fully allowed myself to let go of the old and to embrace the new. I have met so many new friends. So many of them I had met before, but this time I was ready to let them into my heart. Just yesterday I had the most delicious moment with an older gentleman. He parked his walker beside me and I jumped up to hold the door open for him. “It’s already snowing in Regina,” he said. “Thank you so much. I will make sure I avoid it today.” “Good.” He said. Perfect moment. So much love and fun flowing between us. The most perfect people flow into my experience, and those who aren’t a vibrational match simply flow by. I fully embrace the knowing that I am pure positive love energy. I don’t trip over my words anymore and can say exactly what I want to say when I wanted to say it. While in France, I spoke perfect French! I tapped into everything I had always been and my mind and words were able to flow with ease. A few days ago I even sang “Here, There, and Everywhere” while walking down the streets of Lido di Venezia without a care in the world. The disconnected me would have been shy and scared to have people listen to me. One day after meditation, I floated down the stairs and ran smack into Esther. I thanked her for everything she does and she said something like “It’s fun to have fun, isn’t it?” I said, “If I told you about all the fun we’re having I’d be here all day. So I just want to say thank you.” I realized then that she was holding my hands. Such a beautiful experience! What a wonderful memory I will have forever. And it is with excitement that I eagerly anticipate another rendez-vous! The day I cancelled all of my plans I ended up having a wonderful day walking through Napoli with a new dear friend. We had the best pizza I’ve ever tasted, the best coffee in the cutest alleyway off the beaten path, and afterward went to a beautiful sail away party at sunset. That party led to an incredible dinner and connections I will have for life. The dinner led to a day on a Yacht sailing around Malta the next day and even more love and appreciation for the souls I was coming to know; to remember. And from there life just keeps getting better and better. My heart is full. The work I have done is radiating out for all to see and for all of my mirrors made of flesh to return to me. My kids are radiating and my partner and I have a greater understanding of what we mean to one another. I love knowing that everything is always working out for me and in the best interest of everyone involved. Life is too precious to spend unhappy and happiness is my greatest goal in life. Most of all I love how my intentions, no matter how small, played out seamlessly. Like a thought to save someone in particular a seat one day that didn’t work out, worked out the next day without me even trying. I found myself with a front row seat to gift to the most amazing woman ever, just as I had intended. I especially love the moments of inspiration that don’t make any sense. Everything makes sense in the end! I love that I can continually see the evidence of my alignment, or lack thereof, and that I am able to change my thoughts or my state by simply choosing another thought. If I find myself in a place that I can’t get back from, I just go to bed and start again the next day with meditation and appreciation and the desire to listen to that little voice in my head. Alignment is everything.